Here’s my theory on the shuuto: it’s Japanese for “inshoot”, and it can describe any pitch that tails to the pitcher’s arm side, including the two-seam fastball, the circle change-up, the screwball, and the split-finger fastball. I came to this conclusion after noticing that Hisanori Takahashi’s circle change-up was described as a shuuto. All the research I did on the web uncovered many apparently different pitches as shuutos. 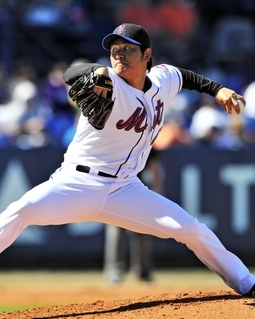 Greg Maddux’s two-seam fastball was described as the American pitch most like a shuuto. The thing about that is…Maddux’s two-seamer is pretty much like many other American two-seam fastballs. I was even pointed at this post on Jonathan Hale’s Mockingbird blog about how to throw the shuuto. The description there looks very much like a two-seam fastball. In the comments, then high school, now college pitcher Jamichael Oxley described his screwball-like pitch as a shuuto. Eventually, I decided that the only thing all these different pitches had in common was that factor encapsulated in the name: inshoot. I’m not sure that I’m right, and I’m certain many people will disagree with my theory. But here’s what I’d like to hear: which pitcher do you know that throws the shuuto, and how does he or other observers describe it? Did he pitch in the World Baseball Classic, such that we might have PITCHf/x data for his pitches? I’m particularly interested in pitchers who throw more than one type of inshoot pitch but label only one of them as a shuuto. I’m also interested in photographic and video evidence of the shuuto. Masato Yoshii threw the first shuuto I heard of for the Mets in the late 90s, though I recall it being described as a cut fastball, ie with the ball moving to the left from a right handed pitcher. I also found a link describing righty Hideki Kuroda’s shuuto as a sinking fastball that cuts left, here: http://factsanddetails.com/japan.php?itemid=767&catid=18, the description comes about 90% down the page under the ‘Saito and Kuroda’ heading. If a Shuuto is just the description of a ball with pretty good armside movement, I would have to imagine Ubaldo Jimenez has the greatest shuuto ever thrown. I’ve never seen a fastball in the high-90s thrown with that much horizontal movement. Just watching on Sportscenter, you can see the ball moves well over half the plate. It’s shockingly good (and trust me, I’m not a Rox fan, just an impressed baseball fan). the option of using a web template can provide a multitude of benefits. Templates are ready to go upon download and are quickly uploaded to the server, on which your site car club templateis hosted. Configuration is straight forward with the instructions that are sent along with the web template files.